At Alaska Printing, we love what we do. The passion we have for our work enables us to take ownership of our clients' projects. We constantly strive to deliver the highest-quality products possible. Our mission is to provide you with the highest-quality products and services possible in a timely fashion and at a competitive price. We promise to listen to you and help you achieve your business goals. We will always be there with honest, expert advice and quick, friendly customer service. At Alaska Printing, our goal is to meet and exceed your expectations. Although we're proud of our products, services, and technology, nothing matches the pride we have in our staff. You see, we learned long ago that we're really in the business of building relationships. For that reason, we put a premium on hiring only the most qualified individuals to serve on our team. 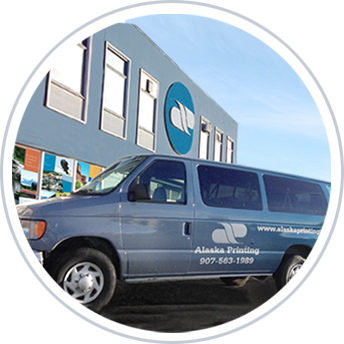 At Alaska Printing, every person on our staff is committed to providing excellent customer service and producing high-quality products and services. As you work with us in the future, we're confident that you'll find this to be true. We’d like to introduce you to our people. For over 48 years Alaska Printing has been providing Anchorage and the outlying bush areas with high quality printing services. We are proud to be Alaskan grown, and as a family owned and operated business, we understand the needs of the Alaskan business community. The printing industry has changed a lot over the years; nonetheless, we have remained in business evolving, and here at Alaska Printing we strive to stay up to date with the latest in technology and equipment. Want to know more about the people, culture, and physical plant here at Alaska Printing, Inc.? Great! We are so happy that you wish to get to know us better and form a happy relationship with us for years to come. Just follow the provided links for more information about us. Once you take the time to find out what we're all about, we're confident you'll like what you see. 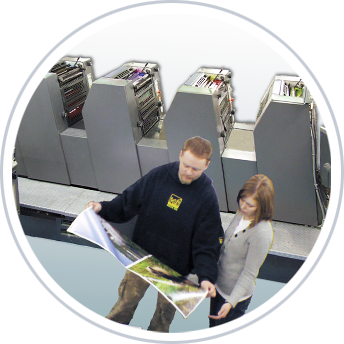 At Alaska Printing, we utilize the most current technology in our industry. Our state-of-the-art equipment allows us to provide our clients with high-quality products on time and within your budgeted amount. We realize that most people could care less about what model of press or copy machine we use, so long as they receive what they ordered. Still, we can't help being proud of our toys. Once you see how great they make you look, we hope you'll be proud of them, too.